Comments: The Old Tavern is located on the north side of Scottsville's Main Street and across the street from the Herndon House and Colonial Cottage. This two-story brick building shows the pioneer split-level composition of a single and double gallery, connected by a covered outside stair. Although the exact date of its construction is unknown, the Old Tavern probably was built in the late 1700's to early 1800's. 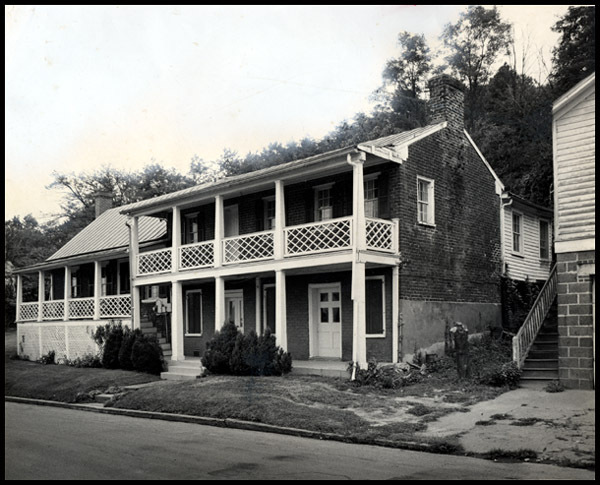 With its close proximity to the James River and Kanawha Canal, the tavern fed and sheltered many canal travelers, boatmen, and freight wagoners to Scottsville. Walking by the tavern today, the imaginative might hear fiddles and smell hot venison pie. After its heyday as a travelers' rest stop, the Old Tavern building has been used for many purposes including serving as the office for the Scottsville News and Albemarle Courier in the 1940s. According to one of its former newsboys, the News' pressman always required a shot of orange juice and vodka to steady his nerves before each press run. Later this building was used as a private residence, and today in 2002, the Old Tavern has been restored and rented as office space.